Well, now that we have your attention. We understand you're one of the Dracula clan, yes? The no garlic, hates crosses, lives-on-the-blood-of-humans vampire type (not the sparkly road-runner version)? As we thought. A classic Vampire. Pleasure to meet you! We'd like to extend our humblest gratitude for not eating us on sight. Now that we've been acquainted, we have to ask. How long have you been wearing that outfit? We know your type has ... how shall we say... an exceptionally long life span. You have a different diet, different sleep schedules, and we're not even going to mention your beauty routine. Since you don't operate under societal norms and expectations, we imagine you probably have been wearing that outfit for a while. Ten years? Yeah, that's a while. We don't mean to alarm you, but the ten years of wear and tear is starting to show. You're looking a little faded around the collar. There's a couple buttons missing, a stitch or two popped... and yes. We see those burn marks (good for you for getting out of a hairy situation)! But worry not, our batty friend! 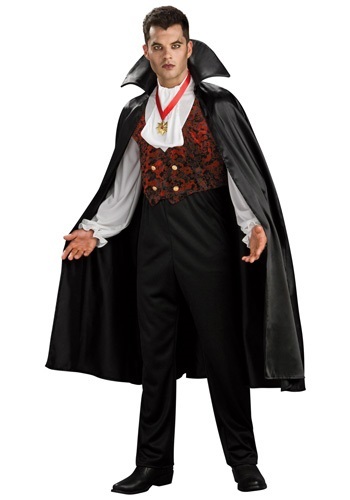 We have the Adult Transylvania Vampire Costume for you! A fresh vest, cape and collar, with a new medallion to boot! Don these and you'll look as fresh as... well... as if you just sprung out of the coffin. It made my husband look like an amazing vampire like the cool ones from the movie "Interview With A Vampire"!